Korean cuisine wouldn’t be what it is today -- spicy, savory and soupy -- without jeotgal: fermented seafood used as a seasoning or condiment. And salted shrimp, or saeu-jeot, is a key ingredient in quintessential Korean food such as kimchi, as well as an indispensable relish enriching broths such as dwaeji gukbap and sundaeguk. Along with salted anchovies, salted shrimp is the most popular jeotgal variety used in Korean cooking. It often replaces salt in dishes such as steamed egg. Salted shrimp goes equally well with jokbal -- pork knuckle meat -- as well as bossam -- sliced steamed pork served with cabbage. Jeotgal pairs well with pork not just because of its acidic flavor that neutralizes and spices up the pork’s fattiness, but because it contains amino acids that break protein and help the digestion of meat. Amino acids -- allicin and glycine -- found in saeu-jeot also aid the growth of the human body, while its taurine helps with physical recovery. Salted shrimp is made of mysid shrimp, also known as oposum shrimp. The tiny shrimps live in both shallow and deep marine waters as well as some freshwaters worldwide. Mysids are filter feeders: omnivores that feed on algae, detritus and zooplankton. They are used as a food source for other cultured marine creatures. They are sensitive to water pollution, so they are sometimes also used as a bioindicator to monitor water quality. To make saeu-jeot, shrimps found in the western sea of the Korean Peninsula, bordering Gyeonggi Province, South Chungcheong Province and South Jeolla Province, are used, as they are of the highest quality. In 2016, 17,000 metric tons of mysid shrimps were caught off the western coast. The most highly prized saeu-jeot are made with shrimps caught near Ganghwado in Incheon, as the waters there are full of nutrients from the Han River and Imjin River that meet around the island. Ganghwado has been home to mysid shrimp fishing for centuries. These days, over 2,000 tons of shrimp are caught there each year. The shrimp caught there are less salty than other Korean shrimp, and even ended up on the tables of royalty. The high seasons for catching these tiny critters are between July and October, while those caught in June -- the breeding season -- are the largest in size and often have eggs. The June catches are the most delicious and also the most expensive, fetching 15,000 won per kilogram -- up to three times the price of shrimp caught in other months. The quality of salted shrimp depends on the freshness of the shrimp, so the shrimp is salted immediately after being caught. They are fermented for at least three months at around 15 degrees Celsius using bay salt, which is full of magnesium, calcium and potassium that prevent decay and nurture the germination of healthy bacteria. The amount of salt used and temperature at fermentation differ seasonally and regionally. 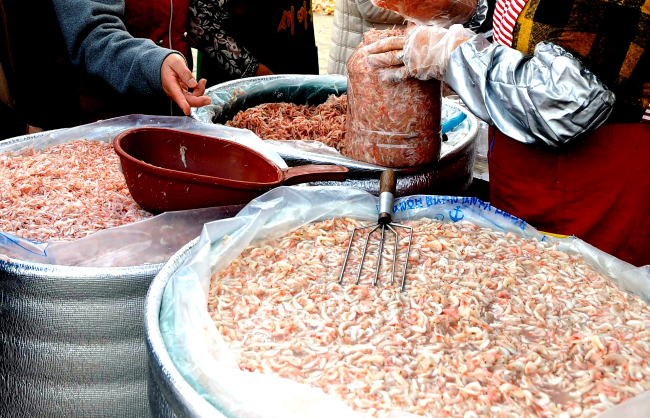 Salted shrimp is celebrated at festivals across Korea. The annual salted shrimp festival at Maponaru -- the site of jeotgal trade during the Joseon era (1392-1897) -- in Seoul’s Mapo-gu District is held in October. Another renowned salted shrimp festival takes place at Ganghwado in Incheon in October.